We should try our best to get complete nutrition from our diet by eating high-quality whole foods in the right combinations to optimize digestibility. However, since CF digestion is, even at its best, not very efficient, we need to make sure we are getting all of the vitamins and minerals we need for good health, even if we are not able to absorb them from our food. Therefore, supplementing with vitamins and minerals is a must. Seafood is one of the healthiest foods you can eat. Oily fish are particularly high in the anti-inflammatory omega-3's EPA and DHA. Furthermore, high-quality fish oils are very high in the fat-soluble vitamins that CFers need so badly. But sometimes we can't eat or afford as much fish as we'd like to. So I supplement with the highest quality fish oil I can afford, and that means I choose a high-DHA oil like Jarrow's Max DHA or wild salmon oil. If I could afford fermented cod liver oil, that would be my first choice. There are a lot of low-quality fish oils out there that are essentially a waste of your money and a strain on global fisheries. In order to make a more complete decision on which fish oil to take, I recommend reading Chris Kresser's article on the subject, the Definitive Fish Oil Buyer's Guide. Remember that all fish oil and fat-soluble vitamin supplements (A,D, E, K) must be taken with a fatty meal and enzymes for proper absorption. Taking them on an empty stomach with no enzymes will not do you much good. Whatever dose is recommended on the bottle - double it. People with CF have such a high burden of oxidative stress that adding extra omega-3's to our diet is a must. In addition, we must strive to reduce the amount of omega-6's in our diet, which are common in vegetable oils and seed oils. If you frequently expose yourself to these inflammatory oils, increase your dose of omega-3's even further. An ideal ration of omega-3: omega-6 oils in the diet is 1:2 - 1:4. The typical American consumes a ratio of 1:10 - 1:20! How inflammatory! From all the antibiotics we are on, our gut flora are constantly getting disturbed. In addition to killing bacteria in the lungs, oral and IV antibiotics also kill gut bacteria, often the good species that help us digest our food, keep our intestinal cells healthy, and protect us from food-borne pathogens and toxins. These beneficial bacteria include Bifidobacteria, Lactobacteria, Propionobacteria, physiological strains of E. coli, Peptostroptococci, and Enterococci. But our guts are home to around 500 species of microbes that, in a healthy body, live in balance and harmony, as species do in all healthy ecosystems . However, when we start killing off certain species in this fragile ecosystem indiscriminately with systemic antibiotics, the balance of species can get thrown off and we can develop a lack of good bacteria and/or an overgrowth of pathogenic/opportunistic bacteria. A lack of beneficial gut bacteria may cause diarrhea, gas, heartburn, poor digestion, and intestinal pain. In addition, recent research has discovered that an imbalance in the gut flora of CF patients can lead to increased susceptibility to lung infections and exacerbations . As CFers, we should minimize our use of antibiotics because their use can lead to long term lung function decline , but sometimes we don't really have a choice whether or not to use antibiotics - when we get a serious infection, we need them, however unfortunate that may be. So when we do use them, it is very important to try to restore the beneficial bacteria that the antibiotics have wiped out - during antibiotic treatment, afterward, and pretty much always. Studies have shown that supplementation with probiotics in CF, particularly Lactobacillus rhamnosus GG (found in Culturelle), reduces the number and length of lung exacerbations, increases body weight, reduces inflammation, and improves FEV1 scores . There are many ways you can take probiotics. The most popular way in our culture is to pop a pill - taking a capsule of several billion bacteria with multiple species and strains. 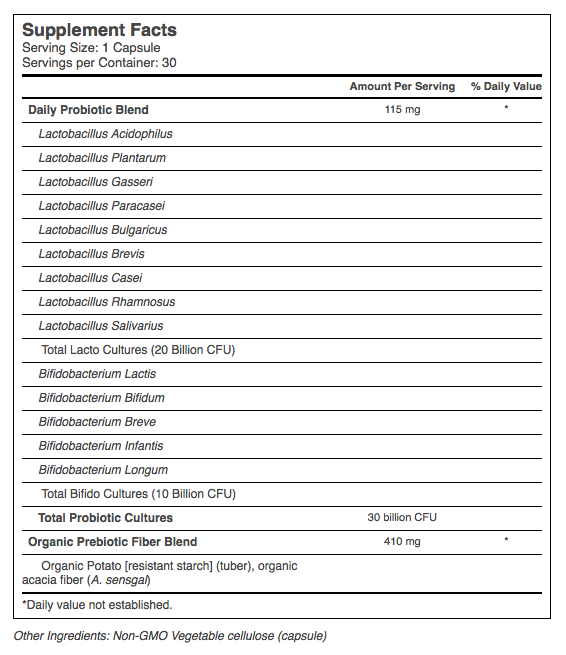 This is well and good, and certainly helps, but the lower-end probiotics don't contain that wide of a wide variety of species, and the actual live bacteria count is often lower than what's labeled on the bottle. There is a tastier alternative that all traditional diets all over the world have used for millennia: fermented foods. These include cultured dairy (real yogurt, keifer), sauerkraut, kimchi, kombucha, kvass, fermented grains, fermented meats and fish, etc. Fermented foods contain a much wider variety of species or strains and a greater number of actual live bacteria. Personally, I use both. For best results, I take my probiotic pills just after a meal so that the food buffers and protects the bacteria from direct exposure to stomach acid, which kills our little friends. I also eat a tablespoon of sauerkraut a several times a day, preferably 10-15 minutes before a meal as an appetizer to trigger the production of stomach acid and pepsin. I take probiotics in these ways whether or not I'm on antibiotics. Make sure that if you buy your fermented food at the store it says "live", "raw", or "probiotic" - if it's been pasteurized or cooked in any way after the fermentation process, it is no longer probiotic. Most commercial yogurts you can buy in the grocery store are not probiotic, but you can make your own at home (if you tolerate dairy). Contains at least 10 different species of bacteria. Contains at least 10 billion CFUs per pill. Make sure the label says something like, "potency guaranteed at time of consumption" or "potency guaranteed until expiration date". It should NOT say, "potency guaranteed at time of manufacture" because that means that after the pills leave the factory, there is no guarantee that any of the bacteria will remain alive in them when you consume them. The probiotics are encapsulated in such a way to protect them from stomach acid. They must be either freeze-dried encapsulated and therefore shelf-stable (like Culturelle and BioKult) or refrigerated throughout the entire chain of transit and in the store. If probiotics with Lactobacillus in them make your digestive symptoms worse, consider taking a soil bacteria based probiotic, like Prescript Assist. Kid formulas have fewer CFUs per capsule, and some aimed at infants or toddlers contain bacterial species known to be found specifically in the infant/toddler gut. However, the adult gut is so multi-factorial that we do not yet know enough formulate "men's" or "women's" or "senior" formulas. So it is perfectly fine for females to take "men's" formulas or males to take "women's" formulas. The differences between them are mostly marketing. Try to choose probiotics with the least amount of added fillers (like lactose). But some probiotics come with prebiotic fibers added in, and we call these synbiotics. These are wonderful and you should preferentially buy these as long as you can tolerate FODMAPs alright. Synbiotics provide a little dose of the probiotics' preferred food source, complex carbohydrates that serve as prebiotic fiber; like going on a hike with your lunch packed for the long journey. ​Label states that capsules are contained in TruPreserve, a canister designed to safeguard the live and active probiotics. To my knowledge a canister can do nothing to preserve potency. There is no statement about potency guarantee. Each of these minerals is usually absorbed from assimilation of animal proteins, but due to low stomach acid and our other digestive inadequacies, we may not be absorbing the iron and zinc we get from our food. In addition to working on improving mineral absorption, it is helpful to take supplemental forms of these as well. A chelated mineral is in a form that is similar to the way it naturally occurs in foods, bound to an amino acid so that it is stable enough that it doesn't bind to other minerals while moving through our digestive tract, and yet can pass into our cell membranes easily for utilization. Zinc is important for wound-healing, adequate sense of taste and smell, and the ability to fight infection. I've noticed that after several months of taking chelated zinc, my sense of smell has improved (it is almost non-existent, so any improvement is much appreciated!). It is also crucial for the conversion of linoleic acid (omega-6) into GLA, and GLA into PGE1 (see the Fats section for more info) . I take one 50 mg tablet of chelated zinc once a day. Be aware that taking mineral supplements like zinc and magnesium may reduce the absorption of certain oral antibiotics (e.g. minocycline) so don't take them at the same time. Make sure to read the info on your oral antibiotics that your pharmacist prints out for you. *** A note on iron supplementation: I had previously written that iron supplementation may be beneficial for CFers since, due to our malabsorption issues, we may be anemic or close to it (I am). However, a recent study I read suggests that iron actually feeds the growth of Pseudomonas in the lungs. CF lungs are unusually high in iron, especially in the lungs of people with the deltaF508 mutation, as a result of the faulty CFTR ion gradient. One in-vitro study discovered that supplementing the airway cells with iron increased pseudo growth and the proliferation of its biofilm, while using an iron-chelator (a compound that neutralizes the iron) reduced the formation of pseudo biofilms . So, in conclusion, it may not be beneficial to supplement with iron after all as it is possible that we have a pseudo overgrowth in the guts as well as the lungs. No human studies have been done on this issue, so there is no evidence that says oral supplementation with iron is going to encourage growth of pseudo in the lungs, however I've decided to stay away from it just in case. This may be one reason why my acupuncturist found, upon testing my pulses, that my body did not like iron supplementation, even though I am technically anemic. I am also a double DF508. Magnesium is a very important mineral that most Americans are deficient in because it is absorbed from vegetables (which few Americans eat enough of). Magnesium is critical for optimal absorption of calcium. Calcitonin is a hormone that increases calcium levels in the bones while preventing its deposition in the soft tissues. Magnesium stimulates the production of calcitonin, thus encouraging calcium to be stored in the bones and drawing it out of the soft tissues. Magnesium is also important for mental health and calm nerve function, relaxation of muscles and prevention of cramps, relief of constipation, and blood sugar regulation , plus over 300 enzymes need it, particularly for generation of ATP and the synthesis of DNA, RNA, and proteins . High-chlorophyll plant foods are highest in magnesium, especially seaweeds, spirulina, and nuts and seeds. Magnesium is also high in chocolate, but due to chocolate's high oxalic acid content and the presence of the caffeine-like chemical theobrine, it's not recommended to eat it regularly. Eating it once in a while as unsweetened cocoa (added to a dessert or smoothie) won't hurt you though. I take one 133 mg pill of buffered chelated magnesium once per day when not on minocycline. Plus I add spirulina to all of my smoothies, and sometimes cocoa powder too. Chris Kresser recommends a 400-600 mg supplemental dose per day (I should probably up my dose since my blood work shows a magnesium deficiency). Vitamin D is critical for absorption of calcium and preventing infection, particularly viral infection. Vitamin D is obtained in two ways. The first is through conversion of cholesterol to vit. D3 via sunlight absorbed by the skin. This is why northern peoples evolved to become are fair-skinned - the less skin pigment there is, the more sunlight is absorbed (less sunlight in northern places) and the more efficient the conversion of cholesterol to vit. D3. The second way is through food, primarily seafood and animal fats. The best supplemental form of vitamin D is cod liver oil and has the best absorption rate. But straight vit. D3 capsules can also be taken, although its absorption rate is lower. It's recommended to take 2,000 - 5,000 IU of vit. D3 per day . CFers are generally deficient in vit. D, since it is a fat soluble vitamin, so the more the better. I take a 5,000 IU capsule once a day. Take with a fatty meal and enzymes. Also make sure you get enough cholesterol in your diet, since cholesterol is converted to vit. D naturally in your body. Don't follow the latest fashion and be tricked into believing dietary cholesterol is bad for you. There is a significant and mounting body of medical research pointing to the fact that dietary cholesterol has nothing to do with heart disease and is absolutely critical to tissue formation (particularly in the brain) and healing. Chris Kresser and many others including Dr. Natasha Campbell-McBride have much more to say about this. I used to take a daily dose of HCL with my highest protein meal of the day, before I started using bitters with every meal. See this blog post for more details.